If you are a bloggers and write articles, you just use your common sense before writing your article. Then you start to write your articles, after you collect all information about your articles. You can easily and quickly write your post articles. And you must write your articles in a short time and also try to much articles in a minimum time. I tell you a few things you should do before starting your article blog posts. You must finish your articles related search, before writing and this is very helpful to you write an effective article. And set time schedule, for everything you do for the posts. And read your articles, at least one time. When you have finished writing your posts, add some links to your previous posts. Write a good articles in short time is very easy, if you use your common sense and only believe yourself. Don, t copy paste any article to save you time. Only write your self created article. 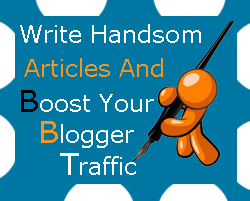 Blog content and your post Head Title are boosting your blog traffic. It is very effective in your traffic when you carefully write your post title. Because every one first sees your post title and after that read your articles. Write small title as you can, because you send your post link to Facebook, Twitter or other Bookmarking sites, so you can easily send your short link to everywhere you want. Always use, powerful word to your title tag. Always write your title first to get your keywords ideas, and you clearly know what you need to write your content in your posts.